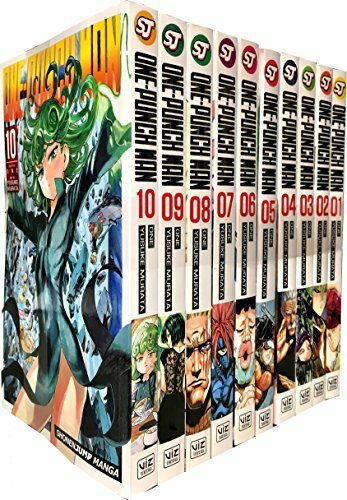 One-Punch Man is a webcomic created in 2009 by a Japanese who goes by the pseudonym of ONE. The plot is actually a satire of the superhero genre. In it, the main character Saitama is invincible as a superhero and could defeat any villain with a single punch. Because Saitama is so strong and unbeatable, he no longer feels the challenge of being in any fight. As a result he wears deadpan expression most of the time. The original webcomic was drawn in a rather childlike manner but blew up in popularity until it was turned into a manga in 2012. Artist Yusuke Murata contacted One with a proposal to redraw the comic and the comic was released on Young Jump Web Comics (となりのヤングジャンプ Tonari no Yangu Janpu), and subsequently collected and published into book format, and later picked up and translated by Viz Media and released into a 10-book set (Amazon links below). One-Punch Man is known for the comedy, outrageous plot, characters and ridiculous schoolboy dialogue. Just the names of the villains should give you an indication of what sort of comic this is. Vaccine Man, Crablante, Subterraneans, Ground Dragon, Armored Gorilla, Mosquito Girl and Piggy Bank. Sometimes the dialogue can be very cheesy. It's the type of lowbrow jokes you would expect from school boys. In this book, they are everywhere and that contributes to part of the entertainment value. The other part is the silly (in a good way) fight scenes that lead really shows off the power of the villains only to have them defeated at the end by Saitama. One punch is the simple move, Sequential Normal Punches is the special move. One-Punch Man is an entertaining read. And it's a refreshing way to turn the superhero genre on its head in this day and age where we have Marvel and DC superheroes saturating the movie theatres.